After I adjusted a trailer support to make the boat level, I set about preparing ‘Sandpiper’ for her first sail. When that will be I do not know, but it will depend on the weather. As soon as an opportunity arises I want to be ready. My priority today was to find secure places for stowing gear. I fitted the cooker to an old plywood storage bin cover that I modified by adding five small shelf supports. They stop the cooker from moving, and at the same time they do not prevent air from circulating under and around it. 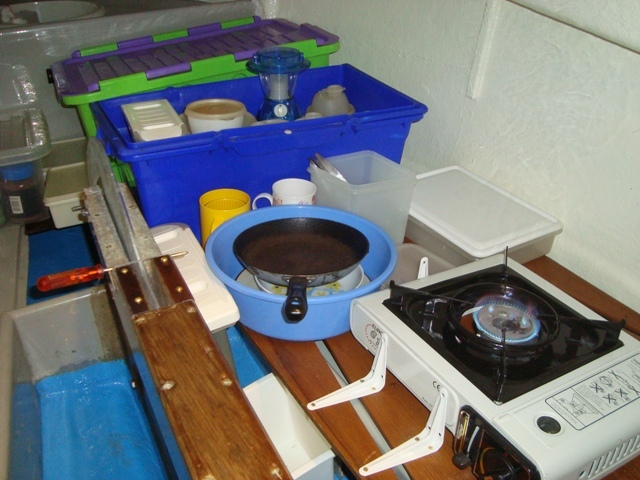 A miscellany of plastic containers for stowing food etc, occupy the forward end of the cabin. My pressure cooker, saucepan and frying pan are housed in the washing-up bowl. 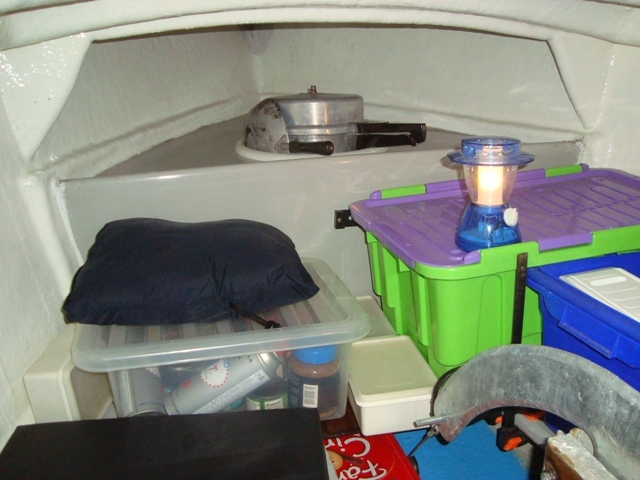 My sleeping bag and mattress are in the recess under the port cockpit seat, and my waterproof vinyl cushion is on the port bunk. 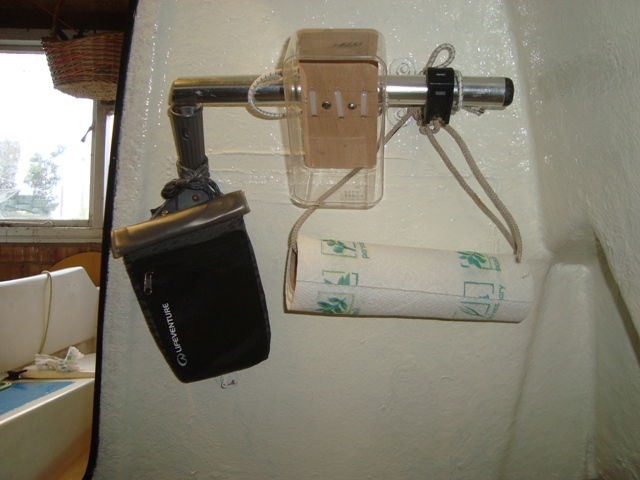 I have a waterproof pouch for my mobile phone which hangs on a cord by the entrance to the cabin so that I can get at it when I’m in the cockpit. I shall have to work out where and how to stow drinking water, and where to place a chart for navigating the boat. Sitting reading your Blog while the wind howls around the eaves of the house - English summer? Bah Humbug I say. You must be frustrated waiting for that window of opportunity to grab your first sail. Where are you likely to launch? I would still like to catchup and say Hi if time permits, we leave for NZ a week this wednesday. The best place to launch for a trial sail will be at Burnham Yacht Harbour where the slipway is protected from the wind and there are no strong currents. Regarding the possibility of us meeting before you return to NZ I'll get in touch via email. if so just wanted to say Hi and maybe you remember Steve Oggs friend Simon who painted Glory in a barn somewhere nr Beaulieu ?? If so would love to chat and here of that sailing expedition you were planning to undertake !! I believe you are referring to Sir Henry Pigot who owned 'Glory' and 'Glory 11'.